Editor's note: TED is a nonprofit organization dedicated to "Ideas worth spreading" which it distributes through talks posted on its website. (CNN) -- When Thomas Heatherwick competed to design the UK pavilion at the Shanghai World Expo, he was sure about one thing: His team wasn't going to showcase "the same cheesy adverts for Britain and promote some silly stereotypes of Britain as fog and rain and Sherlock Holmes and Harry Potter and Beefeaters and phone boxes." Designing what to build instead presented some challenges. "An expo is a kind of bonkers event," the London-based architect said in an interview following his talk at the TED2011 conference in March in Long Beach, California. There were more than 240 pavilions competing for the attention of the millions of visitors to the expo last year. "It's the equivalent of going to all the main museums in New York, L.A., London and every shop in Oxford Street in London. You'd be absolutely frazzled by the time that you might get anywhere near the UK pavilion. So we were very struck that in that context, one of the most important things a pavilion could be would be quite calm and experiential, simple and in some way be a kind of break from what other pavilions might be like." 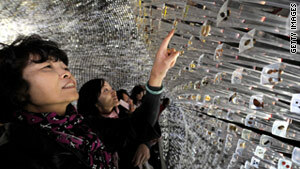 Visitors explore the UK pavilion in October 2010, as the Shanghai World Expo was about to end. The Union Jack flag flutters next to the "Seed Cathedral" at the Shanghai World Expo. Taking a cue from the Expo's theme of "Better City, Better Life," Heatherwick decided to focus on how British cities, particularly London, had integrated nature into urban life. At Kew Gardens, London had "the world's first major botanical institution. ... And London for its size is one of the greenest cities in the world," he said. The result was the "Seed Cathedral," a strikingly different pavilion that commanded attention from visitors with its 66,000 optical tubes, each embedded with a different seed from the Kew Royal Botanical Gardens' Millennium Seed Bank, which is seeking to collect and preserve seeds from a quarter of the world's plant species by 2020. By Heatherwick's account, the project required a different approach from designing a national pavilion. "Normally one person designs a fancy box and someone else scratches their head and says 'Oh my God, what are we going to put inside it?' We really wanted the main architecture that you experience to grow out of the content, but how do you grow a building out of seeds?" "And so this idea of making a hairy building came about. Each one is an optic. And just like the maybe slightly dodgy 1970s fiber-optic lights that people have on coffee tables with all these optical kind of hairs that change color -- we thought, what if we increased the scale to the point where instead of a flea going inside one of those lights, we could make it something that people could go inside, and it would be daylight illuminating those tubes, nothing else. And, slightly to my amazement, it was possible to make that project happen." Nearly all the pavilions, including the Seed Cathedral, were planned as temporary structures for the expo, which ran from May through October 2010. The acclaim for Heatherwick's project led many to suggest that it should remain in place after the expo or be rebuilt elsewhere. But he said that missed the point. Chinese visitors came up with an apt name for the pavilion, he said. They "nicknamed it 'the dandelion' because of that thing when you blow a dried dandelion and you make a wish, and then all the seeds blow away." "The plan with our project was that those 66,000 seeds would disperse and would go to botanical institutions in China, the UK, and schools in both countries as well," Heatherwick said. "The idea isn't, 'It's sad that it isn't existing as a building anymore.' It exists in a somehow bigger way, which is what we wanted." 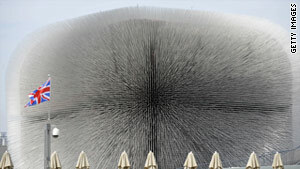 The Seed Cathedral was typical of Heatherwick's approach to design. He said he doesn't aim for a distinctive style that would be a signature of his studio. "I get disappointed when I go around the world and see buildings and you can tell already who's designed them," he said. "I feel that our task as the designers of buildings is to try to find the solution that's right for a place, and ... not have something where someone goes, 'Oh, that Thomas Heatherwick building thing.'" Video interview produced by CNN's Brandon Ancil.